I co-hosted the March BIG Call with a very special guest, Dr. Marianne Bickle, Chair and Director for the Center for Retailing, University of South Carolina. Armed with BIGinsight™ data, Marianne authored the new book, The Changing American Consumer (more on that in a second). For the second half of the Call, Marianne presented NEW findings on the Fast Food industry (which has been a hot topic lately…see also here, here, and here). Using our BIG data, Marianne analyzed consumer trends in Fast Food – by income, census region, and gender – and brought everything full circle with a discussion on The Changing American Consumer. To listen to the recorded webinar, click here. I remember watching it on TV like it was just last night. Theo sauntered down the steps with his hat and sunglasses on, lip-syncing “Night and Day” by Ray Charles all while the Huxtable family danced in concert in front of him. And when Little Rudy stole the spotlight (“Baby, Baby!”), the live audience roared. The Cosby Show was a staple in my household growing up in the ‘80s. My sister and I were allowed to watch it because it featured what my mom considered to be a good, wholesome family. Fast forward 25+ years and it seems that the Huxtables are still viewed as the consummate household… According to a March American Pulse™ Survey, the award for best portrayal of an ideal model family goes to—The Cosby Show. Honorable mentions notably go to Modern Family and Home Improvement. 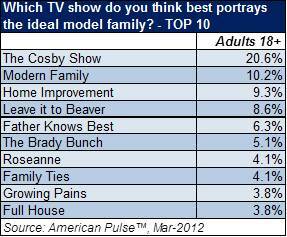 It’s interesting to look across the generations to see which TV family is perceived to be ideal. Gen Xers, Boomers and the Silent Generation alike all list The Cosby Show as portraying the essence of the American family. (Gen Y votes for Modern Family.) But shows like Father Knows Best and Leave it to Beaver pop up among the Silent folks (admittedly, I’ve never watched a single episode of either). 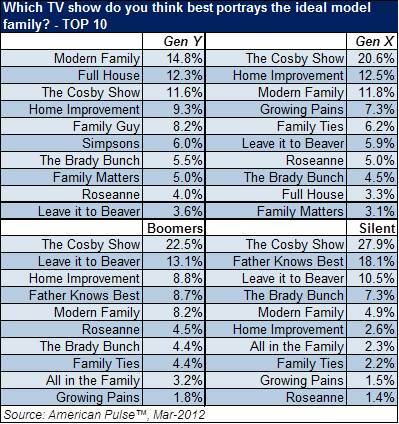 And Home Improvement is a popular choice among Gen X and Boomers, while Gen Y is more likely to list Full House. I would have to disagree with the latter as I tend to prefer Uncle Jesse John Stamos post-Full House (and post-Beach Boys for that matter). Friends is also top of the list for members of Gen Y and Gen X as the TV show that most closely resembles their inner circle. 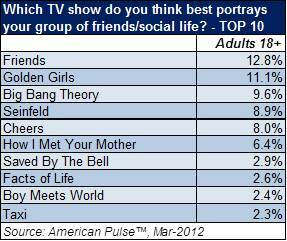 Big Bang Theory comes in at #2 for both. 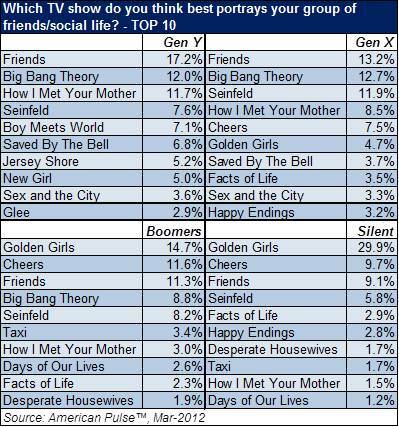 Adults that fall into the Boomers and Silent Generations are more likely to say Golden Girls and Cheers. As a card-carrying member of Gen X, I noticed a glaring difference of opinion between “us” and Gen Y… Jersey Shore made their top ten for show that most resembles their friends. Scary Interesting to imagine Snooki as my BFF. Pain at the Pump: Are $4/Gallon Fuel Prices Becoming Part of the New Normal? During the last week in Columbus, OH, it’s been 80 degrees and sunny on consecutive days, the state of Ohio was represented by four teams in the Sweet Sixteen (including my beloved Buckeyes), and gas prices hit $3.99. Which of these does not belong in the realm of positivity? Well, if you have no interest in Ohio basketball (or basketball in general), I guess you could go with the history-making Ohio representation in the March Madness tournament. And I’m sure if you live in Seattle you could care less what the weather is like in the Ohio capital. But I think I’ll stick with the gas prices. At $4/gallon, it seems that gas prices are making an impact regardless of income level. Just under three in four (74.7%) of those with a household income level below $50K somewhat or strongly disagree, compared to slightly less (72.7%) of those with income levels $50K and up. When asked how they expect prices to change over the next 6 months, the majority (87.3%) of Adults 18+ feel that gasoline will be somewhat or significantly more, compared to 76.9% who feel the same way about food prices and 62.7% who think clothing prices will be higher when Fall makes its arrival. Some consumers, though, are trying to see the glass tank half full when it comes to gas prices. 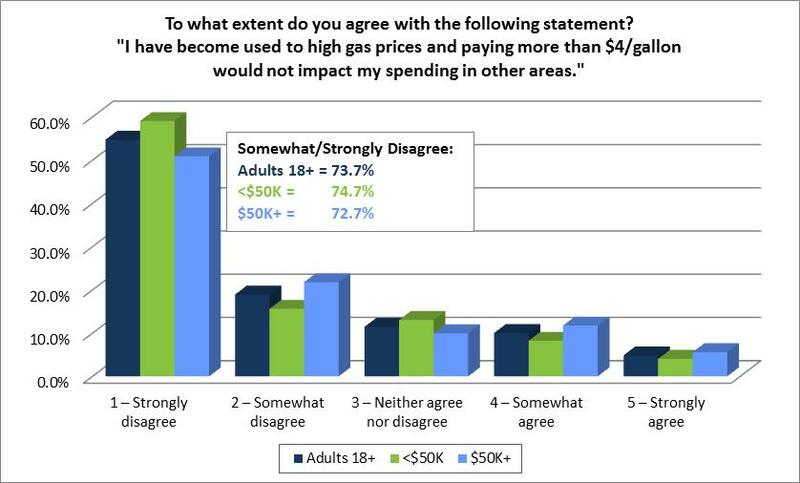 Slightly more than two in five (40.5%) Adults 18+ somewhat or strongly agree with the statement, “Higher gas prices will lead to more alternative energy sources in the long run.” Another point of optimism? Despite higher gas prices, people are planning to spend an average of $145.28 on Easter this year, up from $131.04 last year according to our latest research for the National Retail Federation. In this post-recession economy, we hear the phrase “New Normal” tossed around a lot, meaning that consumers have adjusted to new spending habits and will not return to their pre-recession ways. While gas prices are also causing us to adjust those spending habits, it seems that most of us are not ready to accept $4/gallon as anything close to normal. “Fair is Fair” but is Square…well…Square? The complete overhaul of JCP’s marketing, merchandising, and promotions plans certainly made headlines in the retail community, but what do consumers really think about this strategy switch-up? In addition to being practical and realistic in their purchasing, today’s shoppers are also “intelligent”: researching products, comparing prices, stalking sales, and couponing like crazy. And, consumers are all the more informed when aided by their mobile devices. Knowing all this, it seems that JCP’s new “Fair & Square” approach might be as dated as a Flock of Seagulls hairdo. So who’s buying what JCP’s selling? 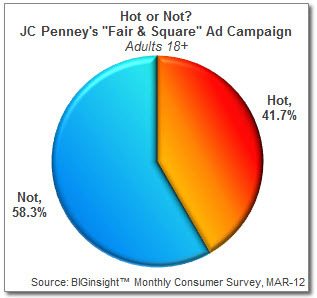 In our March Consumer Survey of more than 9,000 consumers, we put JC Penney’s “Fair & Square” Ad Campaign to the test in our monthly “Hot or Not?” feature. As it turns out, more deemed it “not” (58.3%) than “hot” (41.7%) – placing “Fair & Square” in the middle of the pack compared to the other items we polled this month. But who are the two out of five customers who have at least had their interests – if not their wallets – piqued by “Fair & Square”? These shoppers are more prone to be women (59.9%), married (53.2%), middle-aged (46.7 years, on average), and earning about $56,000/year…sounds like JC Penney’s typical Women’s Clothing shopper. 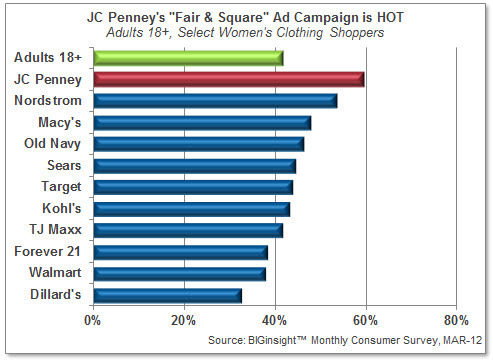 From this standpoint, it appears that most shoppers have a so-so opinion of “Fair & Square” so far. Perhaps they’re walking into JCP to see what all of the fuss is about, but whether or not they’ll convert to the retailer over the long haul remains to be seen – as does the department store’s ability to retain its current customer base. Ah, Love Retail is a Battlefield. * A selection of Women’s Clothing retailers was analyzed for this report. “Women’s Clothing Shoppers” are defined as those who shop most at a given retailer for Women’s Clothing (an unaided, write-in response). Is there a reason behind Payless’ failed commitment to the lead in Shoes? Why isn’t Walmart hot-to-trot in this category, as it is with Men’s and Children’s Apparel, Groceries, and Health & Beauty Care? 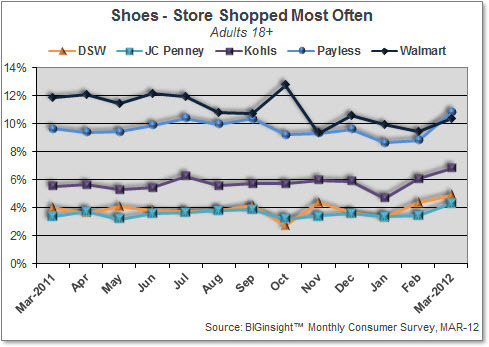 And doesn’t that two month upswing for Kohl’s, DSW, JC Penney look interesting in the chart above? For Your Understanding this month, we’ll hoof it through these questions, courtesy of our Retail Ratings Reports*. 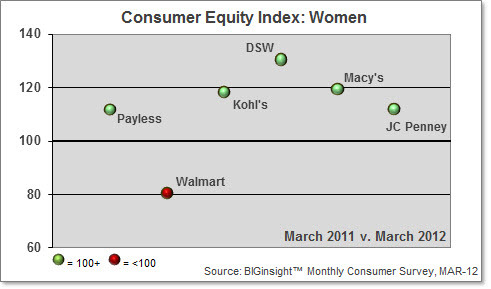 – Women have a preference for Payless, while Men typically head to Walmart most often. But speaking from a strictly biased point of view (#iloveshoes), we females are the Shoe connoisseurs and not-so-much for the fellas, right? – The sweet spot group of customers for both Walmart and Payless earn under $50,000 per year – so these retailers are competing for a lot of the same attention. – Payless is the victor among the young crowd (18-34 year olds) and lands about a point ahead of #2 Walmart with shoppers 35 to 54 years old. Walmart is the favorite among those 55+. – Among the fashion forward set (a growing group of shoppers, according to our latest findings), Payless is most popular, followed by DSW, Foot Locker (OK, maybe a few men do enjoy shopping for Shoes), Macy’s, and finally Walmart. The competition is closer between Walmart and Payless among those who prefer value and comfort as well as shoppers sporting traditional styling. – Payless is tops in the Northeast and out West, while Walmart holds the Southern stronghold. Walmart leads by just a point over Payless and Kohl’s in the Midwest. Our latest CEI ratings for Shoes show that Walmart is slipping in a segment in which Payless shines (along with Kohl’s and DSW and Macy’s and JC Penney): the all-important and all-knowing female segment. Here, Payless has experienced near 12% growth while Walmart is suffering from a near 20% decline. And, recall that sweet spot of core customers for both Walmart and Payless? If you were to analyze the CEI ratings for those earning under $50,000/year, you would find that Payless’ share is gaining, while Walmart’s is waning. Now you understand: Payless is gaining ground over Walmart with two key demographics for both of these discount-oriented retailers: 1.) Women and 2.) Under $50,000 wage earners. Growing competition from the likes of Kohl’s, DSW, and JC Penney may be preventing Payless from gaining surer footing as the lead in this category. Bottom Line: I clearly need more shoes Stay tuned for further developments in this hot category. * Retail Ratings Reports are available monthly for the following categories: Women’s Clothing, Men’s Clothing, Children’s Clothing, Shoes, Linens/Bedding/Draperies, Electronics, Hardware, Children’s Toys, Sporting Goods, Groceries, Health & Beauty Care, Prescription Drugs. The components that contribute to confidence can differ from person to person. Is the stability of the national economy most important? Where do personal concerns with employment, finances, and the future come into play? Does the stock market influence anyone’s sentiment regarding the economy? 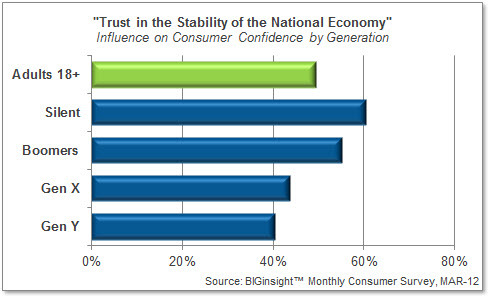 Among adults in general, “Trust in the stability of the national economy” was deemed to have the most influence when determining one’s level of confidence (49.5%). “Trust that your future financial situation will improve” (44.3%), “Trust in employment conditions and your ability to get or keep a job” (42.5%), and “Trust in a positive future for your family” (39.9%) followed. While stability of the national economy was important across all generations, it is most valued among Silents (60.5%) and Boomers (55.3%) – and was each of these segments’ top confidence influencer. The younger sects, though, were more likely to define confidence from a more personal perspective. 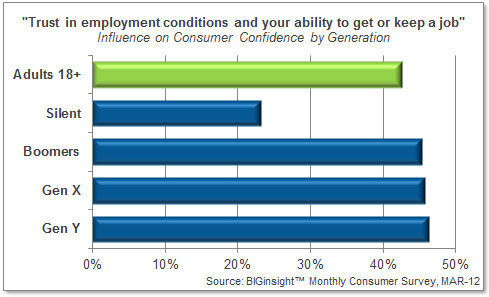 Nearly half of Gen Y-ers (46.4%) said that employment conditions/ability to keep a job was most influential; this was also the #1 confidence component for Gen X (45.8%). Gens X (42.6%) and Y (43.3%) were also more likely to add “Trust in a positive future for your family” to their confidence equation compared to Boomers (38.3%) and particularly Silents (33.3%). “Trust in the future place of employment” was important to nearly a third of each generation, save for the Silent generation (13.4%) – presumably with retirement in sight, or at hand, for these consumers. 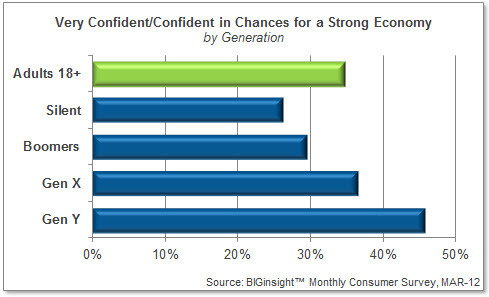 Additionally, the older the generation, the more likely that macro-environmental issues play a role in defining confidence. “Trust in government’s international policy,” “Trust in stock market,” “Trust in government’s domestic policy,” and “Trust in regional economy” peaked among Silents and tapered off with declining age. No matter how you define confidence, though, the slow improvement we’re seeing for consumer sentiment (currently at 34.8%) is a step in the right direction for an economy – and a population – that have been struggling for several years. Stay tuned to see if this optimism can be sustained throughout the springtime or if rising gas prices with quash this good feeling. Is Pinterest Your New Obsession? 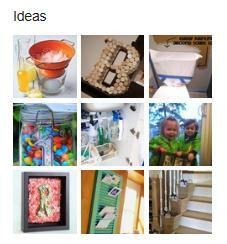 About two months ago my friend asked me why I wasn’t on Pinterest. Honestly…I had heard of it but didn’t really know what it was, and I didn’t have the time or desire to figure it out. I’ve always been the last of my friends to IM, text, join Facebook, get a Smartphone, etc. 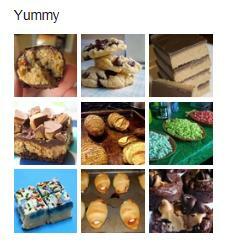 Why would Pinterest be any different?! It just so happened to be a dreary Sunday that I received an invite to join Pinterest. Other than the typical day of cleaning, laundry, trip to the grocery store and family time, I had nothing else to do…why not check it out! Needless to say, my household chores got put on hold! That trip to the grocery store had to wait until Monday because I had to start the shopping list OVER with all the new recipes I found! 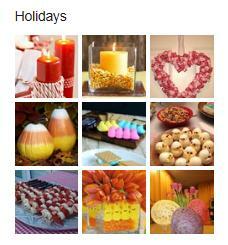 According to the November 2011 BIGinsight™ Monthly Consumer Survey, 19.9% of Females 25-34 said Pinterest was a “HOT” trend. [Yes, I happen to fall into this age break.] Females 18-24 follow close behind at 17% and 13.6% of Moms find Pinterest to be “HOT”. Typically, I log on to my account 2-3 times a week, and have to limit how much time I spend on there. Time gets away from me too easily and I tend to get consumed by the endless amount of pinning! According to a recent American Pulse™ Survey, 8.3% of Females 24-35 say they log in to Pinterest 2-3 times a week. 10.2% of Females 18-24 frequent the site more than once a day–they must be more “pinterested” than I am! BIGinsight™ is a trademark of Prosper Business Development.